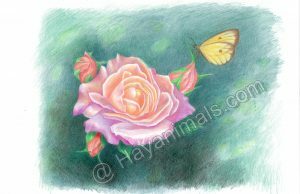 MEDIUM: Coloured Pencil FOR SALE I just adore multi-coloured roses – they are the best! 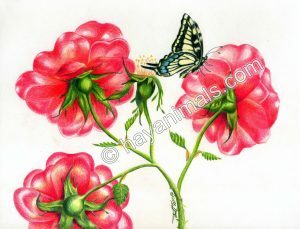 And noone dislikes butterflies! 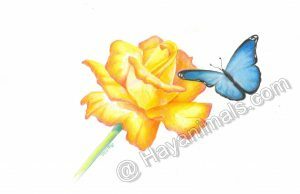 MEDIUM: Coloured Pencils PRIVATE COLLECTION I was asked to create a rose and butterfly but the key was to have the irridescent blue butterfly found in Greece. 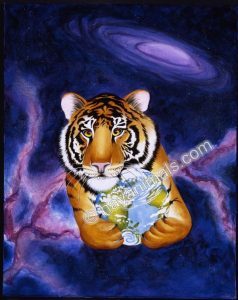 Really enjoyed creating this piece. 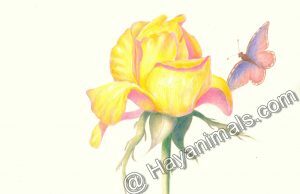 MEDIUM: Coloured Pencils FOR SALE I have often thought that the back of roses are as fascinating as the front and I added the butterfly as I thought it would compliment the roses nicely.